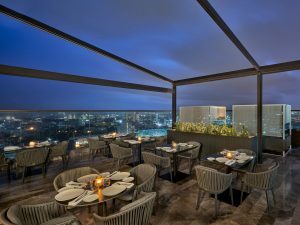 The Den, Bengaluru has announced the launch of Layla, a rooftop mediterranean restaurant, along with a grand opening reception of the first property by The DAN group (Israeli) in India. Located in the IT hub of Bengaluru, the 226-room property provides the right blend of service and luxury for business travellers as well as fulfils the requirements of the destination connoisseurs. On this special occasion, Ronen Nissenbaum, President and CEO, Dan Hotels said, “The Den is an urban oasis and at the heart of it is authentic hospitality and philosophy to do what you want with utmost comfort, panache and just a little edge.” Vinesh Gupta, General Manager, The Den, Bengaluru, added, “The launch of Layla has been much anticipated and we are ecstatic to bring to our guests one of the best mediterannean restaurant in the city. Layla is a beverage-centric restaurant with Mediterranean cuisine with a lively, light-hearted and fun-keeping atmosphere, reflecting a touch of fine dining. We are excited with the launch of Layla and welcome people from Bengaluru to experience a unique dining experience.” Located on the 21st Floor of The Den, Bengaluru, the breathtaking location of the rooftop restaurant makes it an ideal place for a high and fun-filled dining experience with the sky view.